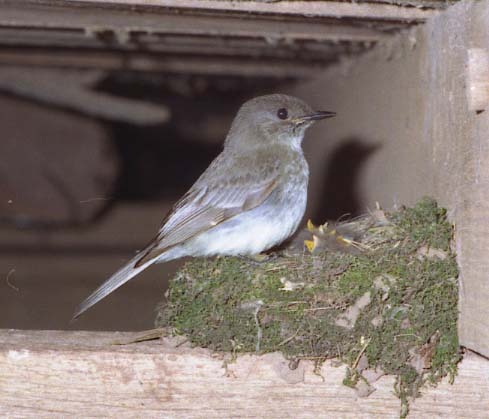 Phoebes often nest in outbuildings if they are allowed access through a broken window or open door. 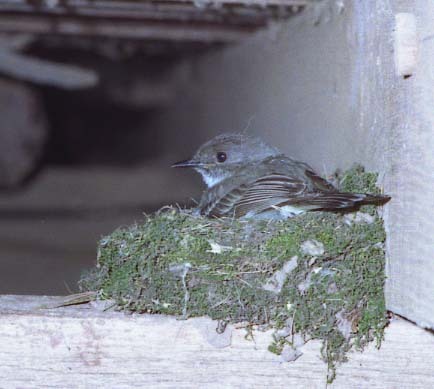 A pair of phoebes nested in our rear barn in 1998, in the midst of the tremendous activity of the barn swallow colony. The phoebes began nesting well before the swallows - their nest with 5 eggs was discovered in late April and the young fledged May 25th. 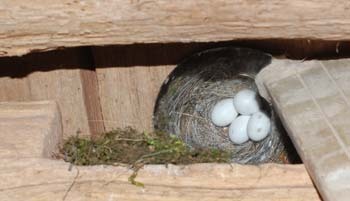 The pair always entered the barn through a small broken window on the west side and nested within 10 feet of the window. 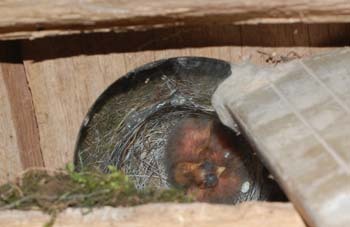 However, there were two active swallow nests between their nest and the window. The swallows used entrances on all three sides of the room, but most of their activity was on the east and north sides, away from the phoebes. 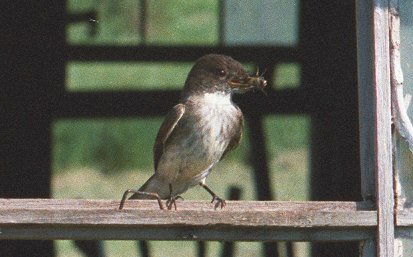 Unlike the swallows, who fly directly to their nests, the phoebe always perched on the window mutton for as long as 3 or 4 minutes before flying to the nest. They also often stopped on the window for a minute or so on their way out. 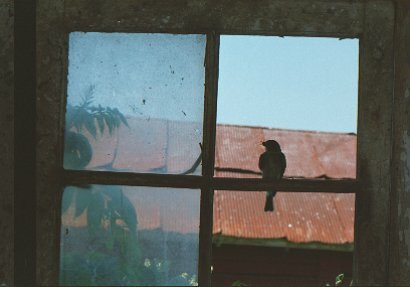 During this time, a swallow would occasionally dart through the small (8x10") window, grazing the phoebe with its wings. 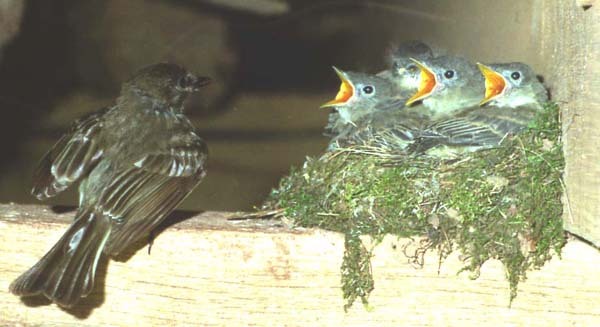 Last year was the first time I noticed a phoebe nest in the colony room. 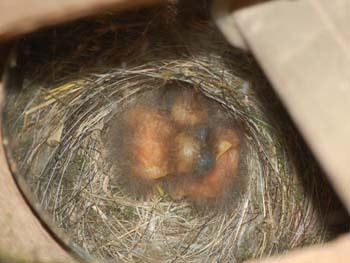 They usually nest in the crib or wagon shed. It will be interesting to see if they choose to nest with the unruly swallows next year or return to a more private location. 2010 update A phoebe pair has nested in the swallow room almost every year since 1998, seeming to not mind the swallow activity at all. This year, their nest is directly in front of the main entrance used by the swallows. As usual, they built their hair and feather lined nest and covered the exterior with green moss. The moss was likely effective camouflage when phoebes nested under rock ledges, but perhaps not since they have adapted to human habitation. However, the mammalian predators that frequent the swallow room (except for me) don't have trichromatic color vision. Luckily, there was only one instance of a kestrel entering the swallow room several years ago. 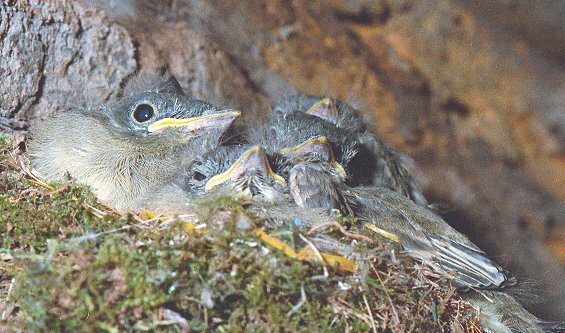 Videotape was recorded for several hours during the nesting period and the five nestlings all fledged in fine condition. 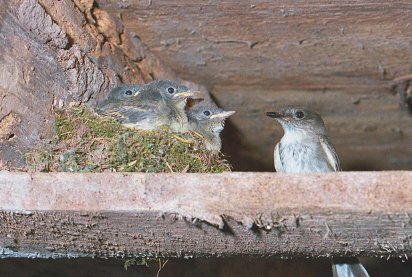 2012 update - A pair of Eastern phoebes nested in the swallow room again this year. 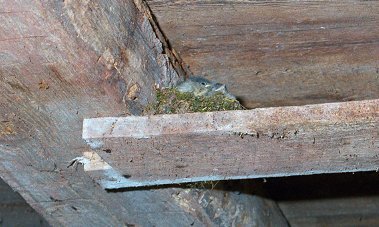 Their nest, always in a different location, this time is on a cut away portion of one of the joists. 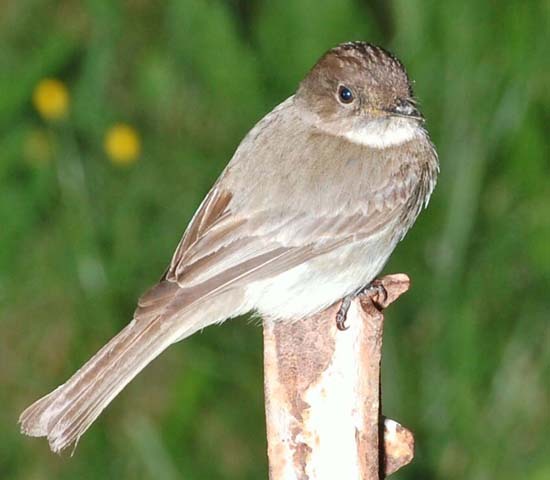 Eastern phoebes are known for reusing their nest site, sometimes for years, but not our pair. Of course, there have been some mate replacements over the years, which may account for that. As in previous years, the prey brought to the nest includes many spiders. A phoebe is often seen perched on one of the tomato cages in the garden, from which it makes frequent forays to capture insects, often dropping to the ground, like the several other species using the tomato cages as a hunting perch. 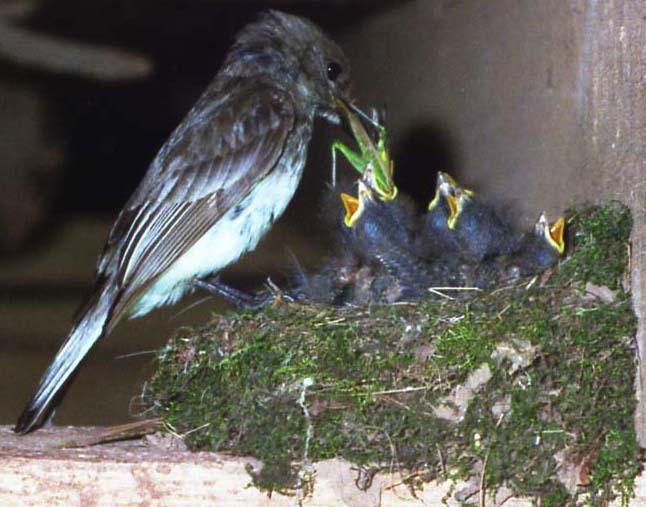 But as do other tyrant flycatchers, the phoebes also sally forth to pluck their prey out of the air. 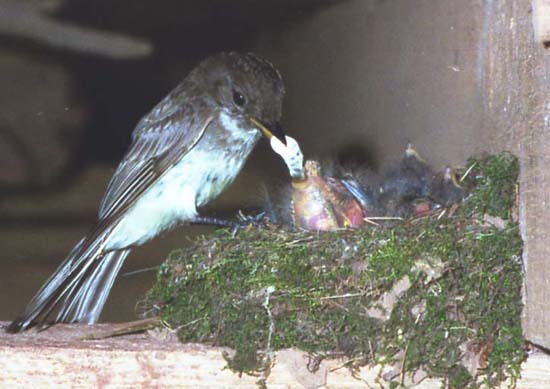 This year's Eastern phoebe nesting was not videotaped, however, frequent photos of the developing young were taken, using the same mirror on a stick used for daily barn swallow nest checks. The phoebes begin nest building before the barn swallows return, and I'm surprised that they have never used one of the wooden barn swallow nest cups. They seem to choose a less exposed site. &COPY; 1999 - 2013, American Artifacts and Richard Van Vleck, Taneytown, Maryland.